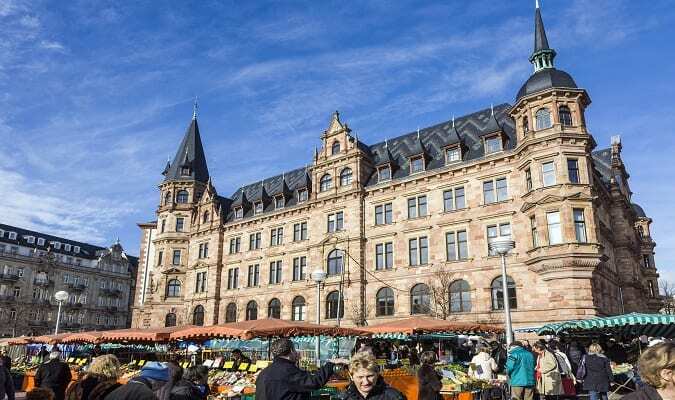 Wiesbaden is the capital of the state of Hessen in Germany. The city is famous for its thermal baths and beauty of its surroundings. The Biebrich Castle was built in 1702 by Prince Georg August Samuel of Nassau-Idstein and served as residence for the Dukes of Nassau from 1744 to 1886. The Neues Rathaus was built between 1884 – 1887. Its neo-renaissance facade was destroyed by bombings during World War II and restored in 1951. Kurhaus is the convention center of the city and hosts many events throughout the year. It is a symbol of Wiesbaden surrounded by green and historic buildings. It has 12 rooms of various sizes and also houses the Wiesbaden Casino. 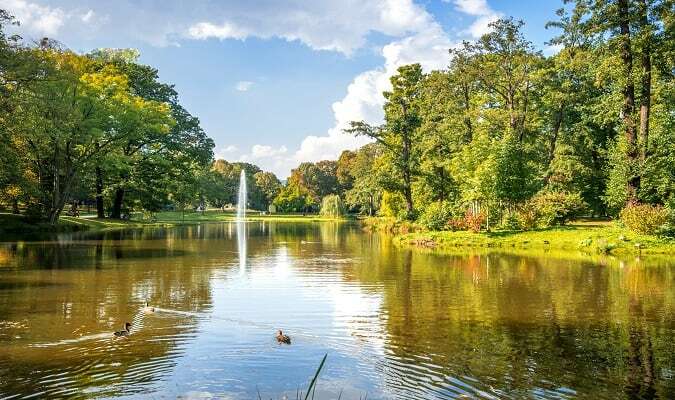 The Kurpark is located just behind the Kurhaus. The park was designed in 1852 in the style of an English landscaped garden. Neroberg is one of Wiesbaden‘s most popular leisure destinations. The funicular was built in 1888. The ride up to the Neroberg Hill runs a distance of 440 meters to climb a height of 80 meters. The St Bonifatius is a church with Gothic Renaissance style built between 1844 – 1849. The Marktkirche is the main Protestant church of Wiesbaden built between 1853 – 1862. The church was once called the Cathedral of Nassau. 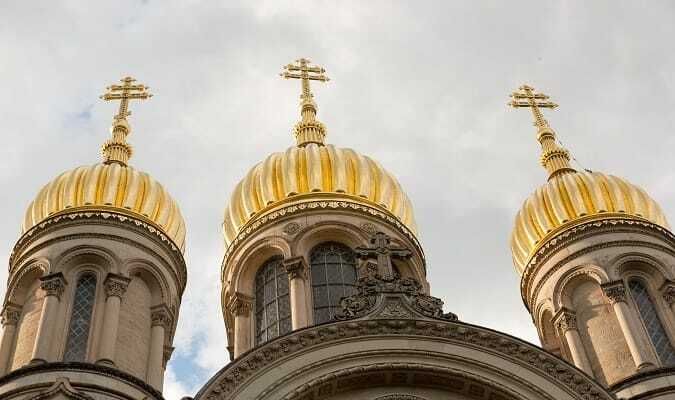 The St Elizabeth is the only Russian Orthodox church in Wiesbaden. It was built between 1847 – 1855 by the Duke Adolf of Nassau. The Wiesbaden Museum houses art collections, natural history and Nassaunian antiques. The museum has a cafe that runs from Tuesdays to Sundays from 11 am. 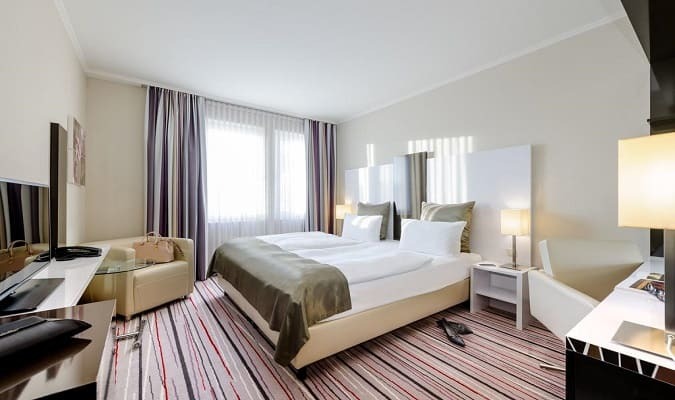 The Mercure Wiesbaden is located in the heart of the city. Rooms are equipped with a TV, minibar, work desk. The NH Wiesbaden is located 2,2 km from the Neues Rathaus. The Nassauer Hof is located in the historic city center. The Lilien-Carré is located 1,3 km from the Neues Rathaus. The Luisen Forum is located 600 meters from the Neues Rathaus. Brands: Gerry Weber, Gant, Tom Tailor, Saturn, Zero. Wiesbaden has easy train access from various cities in Germany. Famous cities nearby: Frankfurt, Mainz.